Seeing the amount of work and effort that went into this I wanted to wait until I had time to digest it fully, before I replied. It seems to me that this explanation makes the armies of Rome equal to the coming of the Lord Jesus, and the “gathering together to Him” is no where fulfilled. The Jewish people were very aware that a prophecy could be spoken (unto us a child is born) hundreds of years before its fulfillment. So the “day of the Lord” requires a coming of our Lord Jesus the Messiah, the King of Israel, and a gathering together to Him of the saints. I can’t see either one of these in the might of Rome coming to crush a Zealot uprising. I can’t see the breath of the Lord’s mouth and the appearance of His coming being equated to the military victory of a Roman general. As always I pray that the veil of man’s wisdom would be removed over all of us and we would see the Truth. See Isaiah 13 for similar language of God’s victory over Babylon using the Persians as his army. What I don’t see in the NT is a speculative rapture, followed by a speculative 7 year tribulation period, followed by a further speculative 1000 millennial period. Sadly, the NT does not comment upon every OT prophetic text which you see as being unfullfilled. But the texts that it does comment upon like Psalm 110 and Daniel 7’13 lead to different conclusions than dispensationalism. This requires no feedback we clearly disagree at the pre-suppositional level of interpretation. Thanks for sharing your thoughts, Chuck. Perhaps others could say more than I have about the meaning of “gathering together to Him.” I don’t think it’s unrelated also to Matthew 23:37 (Jesus wanting to gather the children of Jerusalem together as a hen gathers her chicks under her wings) and Revelation 21:3 (God tabernacling with His people in New Jerusalem). As Patrick pointed out, there are numerous examples in the Old Testament of God using earthly armies as His instruments in judging nations. Jesus did prophesy that He would come in judgment (and in His kingdom, etc.) while some of His disciples were still alive (Matthew 16:27-28). Knowing that all of His disciples passed away in the first century, I would be curious to know what judgment (other than Israel’s judgment in AD 66 – 73) took place during their lifetime in order to fulfill that prophecy. Thanks for replying Adam. (Quick word to Patrick Shelter, I am more against a 7 year tribulation and the common understanding of the rapture than you are, and I do not fall into a dispensationalism category. ) The passage in 2nd Thessalonians demands an interpretation that includes the “gathering together” mentioned in Verse 1. The Jewish understanding of their Messiah is that He would bring an end to the curse of scattering and He instead gather together the people back to the land. Paul, a Jew, realized that the day of the Lord, was a day of judgment and a day of gathering together, it was both, so a proper interpretation demands both would be realized. The section you mentioned from Matthew 16:27,28, states that the kingdom would come and that He would repay everyone according to their deeds, surely this aspect of the prophecy has not happened yet. The explanation is in the next chapter 17:11-13 “11 And He answered and said, “Elijah is coming and will restore all things; 12 but I say to you that Elijah already came, and they did not recognize him, but did to him whatever they wished. So also the Son of Man is going to suffer at their hands.” 13 Then the disciples understood that He had spoken to them about John the Baptist.” Elijah is spoken of as both John the Baptist and as someone who is yet to come and restore all things. This is the truth of scripture when it comes to prophecy, it was, and is and will be. These verses take the pressure off of having to make everything fit into AD 66-73. Elijah was, John the Baptist was many years later and there is an Elijah yet to come and “restore all things”. All glory to God. Isn’t Jesus quoting the tradition and interpretation, and then giving his with ‘But I say to you …’? The phrase ‘but I say to you’ is in contrast, and in the Sermon on the Mount it seems to contrast the interpretations of the Torah teachers with his own authoritative teaching, based, to a significant extent, on the nearness of the kingdom of heaven and the need to re-evaluate the applicability of the Old Covenant practices that would be fulfilled or rendered moot by the kingdom. Not sure this method of asking you a question works or not. I know I can post a comment on your article, but thought it might be better if I could get your input and critique outside of the broader group. Loved your post about the theory of the Man of Lawlessness (MofL) being the Jewish Zealots and the restrainer being the High Priests. Took a lot of research and you laid out the case very well and organized it in a well-structured manner. The only reading I’ve done on the MofL topic presented what it said was the Reformers view, which held that the MofL was the same person/entity as the “another horn” in Daniel 7, and that it was the Papacy ….and that the restrainer was the Roman Empire. This scenario seemed plausible to me as well, so I wondered if you had put any thought into that option. And if so, were there any issues that stood out to you that you couldn’t get around? Again, didn’t really have any critique of your view. Was just curious if you’ve put any thought into the Papacy/Rome view and what problems, gaps you found in it. Thank you for your kind words about this article. I do agree, with a high degree of certainty, that the little horn of Daniel 7 was the same person as the man of lawlessness in II Thessalonians 2. In my articles on Daniel 7 which I posted here less than a year ago, I wrote about why I believe Eleazar ben Simon was also the little horn. 1. The Roman Empire didn’t go down in flames (Daniel 7:11) as Jerusalem/Israel did in AD 70. 2. The downfall of Rome didn’t fit the timeline of when Scripture says the saints would possess God’s kingdom (Daniel 7:18, 22, 27). According to Matthew 21:43-44, Hebrews 12:18-29, and other passages, the saints would inherit the kingdom and New Jerusalem when earthly Jerusalem was judged. 3. The papacy wasn’t formed yet when Paul wrote his letter to the Thessalonians, so I don’t see any possible way that they would have “now” known that something was restraining it and what that was (II Thess. 2:6). 4. The downfall of Rome and the rise of the papacy were many generations beyond the lifetime of the Thessalonians and would have been of no concern to them, unlike Jerusalem’s downfall and the Zealot movement. 5. 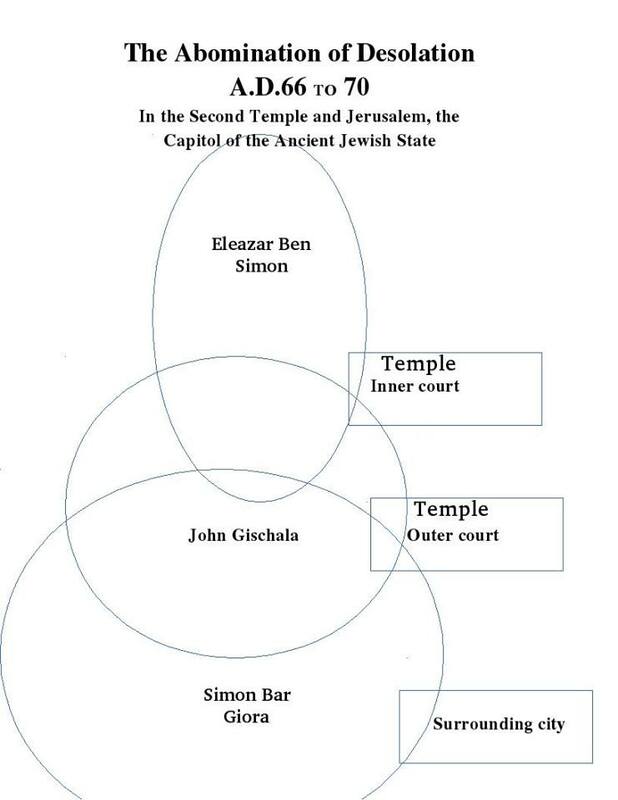 Rome and the papacy had nothing to do with the temple (II Thess. 2:4), which was destroyed anyway within two decades of Paul writing his letter. Thank you, Patrick, and I think what you said is true. Pages could be filled with studies on how types and shadows gave way to the fulfilled realities we enjoy today in Christ. I have bookmarked this website for further research. I would like to return the favor by suggesting two new commentaries on Daniel and Revelation (just gone live last week). If you read the “abstracts” on the index page it will give you an idea of the reasoning behind the commentaries. You probably know that Nero is 666 (and 616) but did you know that Bar Kochba was also 666 (and 616) and that he had his “star” depicted as elevated above the temple? WOW! And I do mean WOW! I was leaning towards Nero and Vespasian with an unnamed Jewish false prophet but this fits perfectly! I wish this understanding was the dominant understanding in Christendom. If you begin to tell people these things, they cut you right off and don’t want to hear it. What lead me into partial preterism is that while reading Matt & Rev., I kept noticing the same language. Then I thought logically about WHO Yeshua was talking to and WHO John was talking to w/the seven churches and reasoned that “soon” cannot mean over 2000 years. I knew something wasn’t right so I explored further. There’s lots to read on your blog and I plan on reading everything. Thank you for all the hard work you put into this. You’re welcome, Carol. Thank you for your encouragement. Josephus also tells us that Annas had 7 sons (to include sons (Theophilus of Luke and Acts), son-in-law, grandson) who served as High Priest. Is this who Luke refers to as the seven sons of Sceva? When Paul writes the letter to the Thessalonians, Annas would still be the “godfather” (for lack of a better word) of the High Priesthood. Is it this Annas who was killed on the first day of the beginning of the war in 66? Thanks for your work. It is very interesting. Excellent work. Paul said in his second letter to Timothy that the churches in Asia had all apostatized by the writing of his letter in 66 AD. 2 Tim 1:15. This is the same year the rebellion began. The ‘falling away’ came first then the man of sin. The Romans kept Simon, son of Giovas as the conquered enemy general for the beheading at the victory parade. Thank you, Anna. Good feedback.